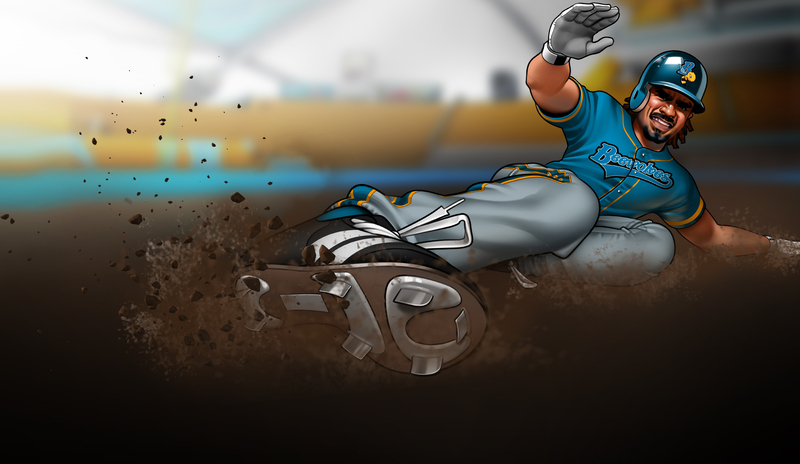 Super Mega Baseball was a home run for indie developer Metalhead Software when it launched back in 2014, and now the series is back for a second inning in Super Mega Baseball 2 (SMB2). We got our hands on the follow-up at PSX last week, and we left the demo satisfied after seeing the game’s new additions and major tweaks. One of the these tweaks could more accurately be described as a complete overhaul. According to Metalhead, the original game’s whimsical art style was a criticism from some fans and press, so for SMB2, they’ve dialed down the comical nature of the game’s world and character design while retaining the game’s fun spirit and atmosphere. This extends to the user interface, as well, which felt generally organized and intuitive, especially when goofing around with SMB2’s customization offerings. The game lets you create your own players, from their clothes to their body types, and it even goes as far as to let you design your own team logo. Once you’ve created your dream team, your customization decisions will follow you online, a Metalhead representative said. Classic teams such as the Crocodons and the Blowfish return in SMB2, and Metalhead confirmed that several new teams will make their debut in the sequel. Developer Metalhead scaled back the original’s over-the-top character designs while retaining the game’s fun-loving spirit. Customization options are just SMB2’s peanuts and Cracker Jacks, though — the gameplay felt tight and the controls were accessible for players like myself who don’t typically play baseball games. The Ego system, a returning feature, helps with that by assigning each player a difficulty (or Ego score) between 1 and 99 (with 1 being the lowest difficulty). When playing against someone with a higher Ego than you in the game’s new online competitive mode, the game will give the lower-rated player advantages in actions such as pitching and hitting. And yes, Metalhead confirmed that an online competitive mode will feature in SMB2 at launch alongside the returning couch co-op mode. Lack of resources prevented them from adding it the first time around, a Metalhead representative said, but the team has since expanded, allowing for the feature’s addition. Super Mega Baseball 2 will launch on PS4 in 2017.